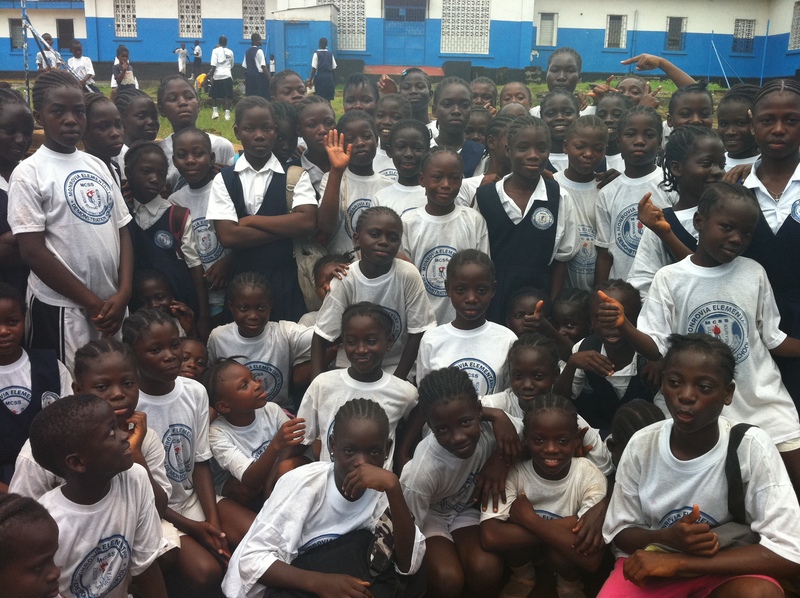 Our Year 1 Hat-Trick Initiative in Monrovia, Liberia. The night before Jaren and I headed to Monrovia, Liberia I was watching the news in my room and saw that Liberia had closed their borders with neighboring countries, due to the elections. Of course hearing this didn’t provide much comfort, but Jaren and I knew that we had a lot of work to accomplish in Liberia. Personally I wasn’t sure what to expect when getting off the plane in Monrovia. I had recently watched a documentary about Liberia that told the story of the recently awarded Nobel Prize winner, Leymah Gbowee. I had read bits and pieces about the history of the country, focusing mainly on the civil war that recently ended in 2003. Walking out of the airport and seeing the bright sign with the words “Coaches Across Continents” being held by Pappie Jones was a great sign as to what to expect from the partnership between CAC and Soccer Ambassadors for Christ. On the first day Pappie took us around Monrovia to the different fields where we would be training the coaches and players. Despite the beautiful ocean in the distant, the palm trees and green vegetation, it was difficult to walk through the streets and witness the houses and buildings, the trash all over the place and the sad faces of many of the Liberian people. Pappie took us to a slum called West Point, where we will be hosting a training next week with coaches from the community, and as we walked through the small and crowded streets of this community, I tried to pay attention to the path ahead of me, instead of my immediate surroundings. I felt like an intruder as I glanced into the lives of the people in this community as women sat selling oranges or breast feeding their young children, children bathed in buckets, kids played with tires, men huddled around watching football matches and everywhere I looked there was constant activity. When we walk through these communities with Pappie, Jaren and I are always a step behind him, and in that distance I have been able to see how much respect he has from his fellow Liberians. Men, women, children, young and old call out to him as we walk by, and often we hear “coach” being yelled from unexpected places. We have been introduced to countless friends, coaches and family members that all greet us warmly and welcome us to their country. 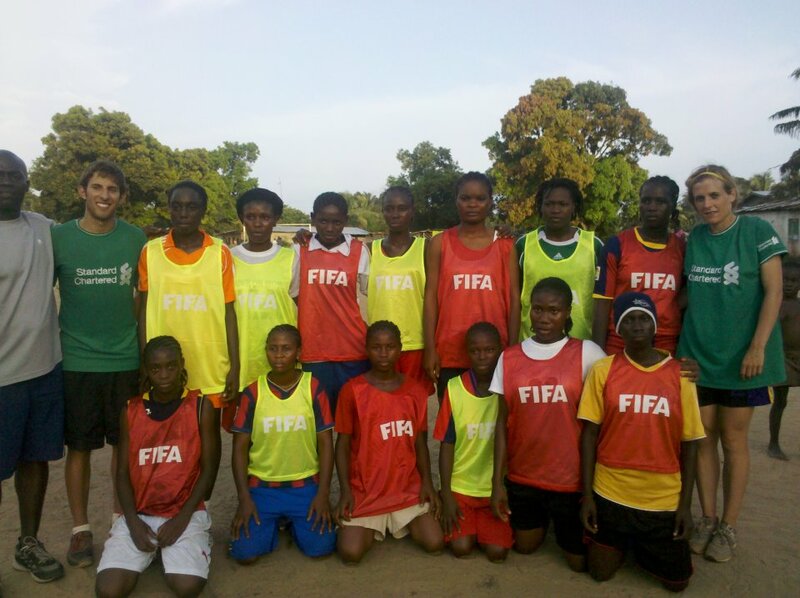 In continuing with what we started in Ghana, I have chosen three moments that will help explain more about the partnership between CAC and Soccer Ambassadors for Christ in Liberia. Trainings with the small group of coaches– We have held two trainings with coaches this past week, one with about 30 coaches and the other with 7 coaches. It has been interesting to adapt the games in order to fit the group size. The group of 7 coaches was the most pleasant group of coaches I have ever worked with because they wanted to learn as much as possible in the allotted time. We were challenged a bit having smaller numbers when we showed several of the HIV prevention games, for example, Can you see HIV which is better explained with larger numbers. 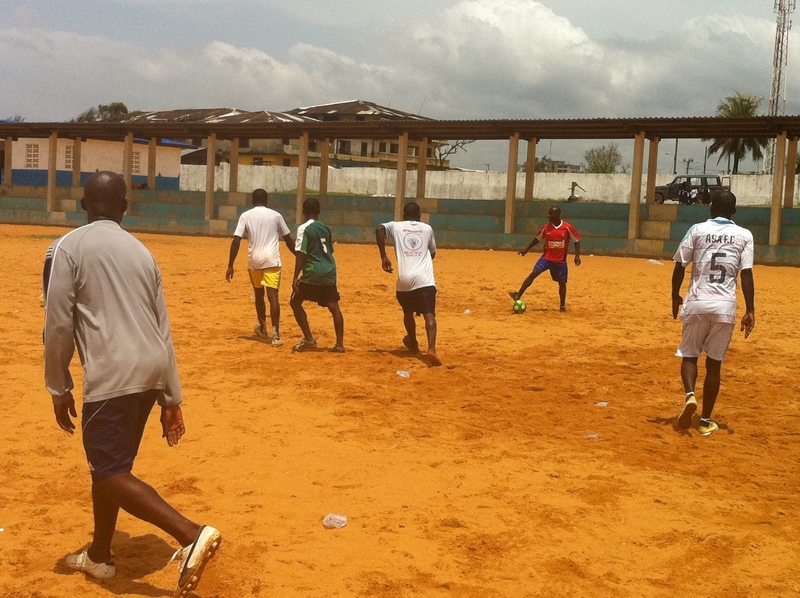 After the trainings we had time to talk with the coaches to learn more about Liberia and it became apparent that there is not much support for soccer here in Liberia, even though it is played everywhere you look. Meeting Pappies sister in law, Ramona Jones gave me a lot of insight into Liberia. She is a very well educated, articulate woman who has traveled around the world and is inspired to bring sustainable change to her community. As we sat on the stoop outside her church I asked her whether the group of kids leaving the church were her children. Her immediate response was that she is a mother to 115 kids. She proceeded to tell us about her multiple roles in her community; principal, director of an orphanage, mother, student and wife. She was the first person we met to really explain to us about the civil war that tore her country apart for 14 years. She reminded us that when working with the youth, who represent the majority in Liberia, we had to always take into consideration the effects of the war on the child. It was an enlightening discussion as I learned that many young females here do not express themselves emotionally because many were raped during the war while many young males have turned to drugs and alcohol to help ease the pain of the war. The female population in Liberia tends to accept that life is just going to be hard and that change is out of reach for them. Ramona was determined to bring change to her community and was delighted that we wanted to help bring this change. Working with the children in public schools and in communities – Our trainings at the school couldn’t have been any more different than the trainings we have had with the coaches. When we enter the schools or local communities with a bag full of balls and people realize we are here to teach football, the whole place erupts with joy. Jaren and I couldn’t stop smiling yesterday when the kids were jumping up and down even before the introduction or training had begun. Every kid always wants to participate so we have found that the easiest is to focus on the simple games, like Circle of Friends, Marta skills, Head/Catch and Ronaldo revolution. With large numbers we feel that it has been the most effective if we can get the kids moving and then talk to them about the importance of drinking water, keeping their bodies healthy and avoiding harmful substances. Again, it has been encouraging that we can take the CAC curriculum and adapt it to all types of situations. We can make it work for everyone and as we leave the field, we have heard many of the children yelling- Ronaldo 1, Marta 2, etc. Yesterday I got a chance to work with all the female students at the C.D.B King Elementary School and know that for most of them it was the first time they had ever seen a female footballer. I asked them if anyone had ever watched Marta or even the World Cup and I got blank stares. I noted that when doing the different games many were very shy and even afraid of trying a simple movement, like a shuffle. I hope that the training gave them a bit more confidence and that I encouraged them to try new things. Jaren and I are looking forward to the weekend, which will include teaching soccer at several orphanages, going to church with Pappie and his family and enjoying the beach. Next week we will be entering new communities, meeting new coaches and working with new students. I look forward to what lies ahead. Previous: Top 3 moments in Ghana with our implementing partners Youth Icons and Standard Chartered Bank. 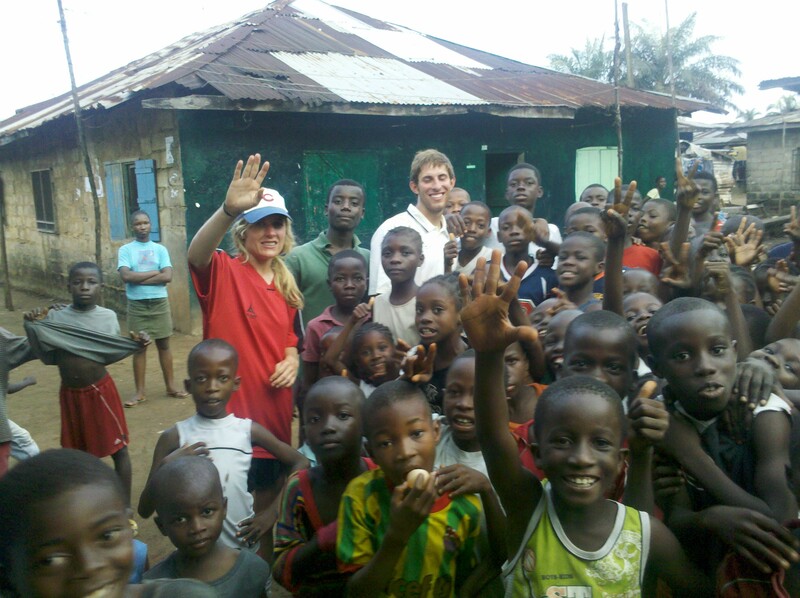 Next: Week 2 in Liberia – Schools, Trainings, Orphanage, Churches, Wedding and Lots More!